Cahans is located in typical Monaghan drumlin country set in a hollow surrounded by little hills, its grounds rimmed with mature trees, an oasis of peace and calm today. It is a special place, some miles from any village or town yet convenient to Monaghan, Ballybay and other places well worth a visit. Along one boundary is a tiny stream, and all around is farmland. To the rear, away from the road is the graveyard. Dating from the 1750s it is still in use. 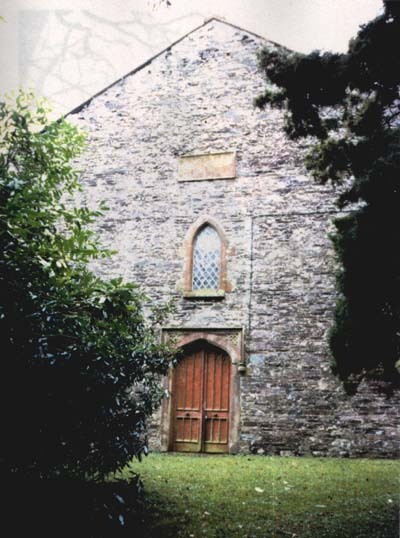 It contains the vaulted grave of Elizabeth and Robert, wife and son of the first minister, the grave of its second minister and those of prominent Cahans’ families. In the grounds is a small two-storey building, a lecture hall above former stables and the remains of a tiny sexton’s house, and just outside the grounds is a small two-storey disused home which was once a local shop. The interior of Cahans has an entrance hall with a small upstairs session room. Two doors lead into the worship area which has a central block of box pews (installed in 1915) with two aisles and side rows of pews. The pulpit is large and high – and unusual. On one side of the minister’s central place is a bench seat for the precentor, the praise leader in days when instrumental accompaniment was forbidden, and a penitent’s seat for anyone under church discipline before repentence and restoration to full fellowship in the congregation. One American visitor, Elizabeth McCalla wrote of the pulpit that it is “the most beautiful I think I ever saw”. Architect Mary Kerrigan says, ‘Built in 1840 the Presbyterian meeting house at Cahans is a fine example of 19th century rural Irish church architecture. Simple in terms of its form with a double pitched slate roof it was built in local stone believed to have been quarried from the low lying boggy area due east of the existing graveyard. It is in the gothic style with simple cast iron window frames set in timber tracery. Externally the rubble stone walls have been bedded in lime mortars. ‘Fine quality carved sandstone quoins to gothic windows and hood mouldings over the main door remain and add much to the architectural quality of the building’. Memorial tablets remember those who died in the 1914-1918 War, David Nelson and his Victoria Cross award, and other members of the congregation including one by a son to his mother, Margaret McCullagh, a valued member, and another in memory of a friend who died early in life. All the memorials are now in First Ballybay church for safe keeping and visibility. There they are among the living faith community of which Cahans is a vital part.